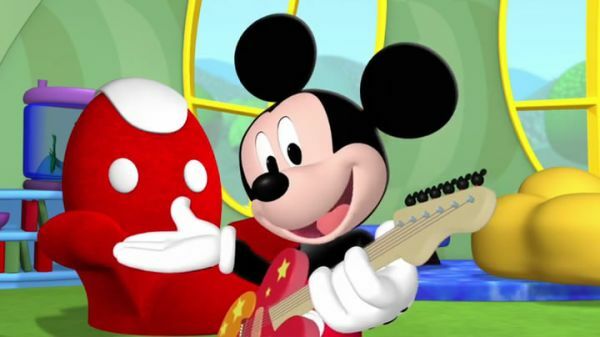 MICKEY MOUSE: I got a song, that comes straight from my heart! I got a song, I hope you'll like from the start. I got a rocking song I want to sing for you and you! 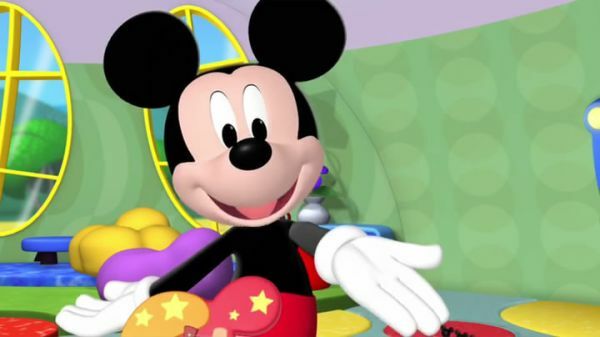 MICKEY MOUSE: Hi everybody! I'm just working on a new song, but I still need to figure out how it ends! Today we're putting on a Clubhouse battle of the bands. That's a fun contest and all of our friends are going to be in it! Hi Minnie! Oh! 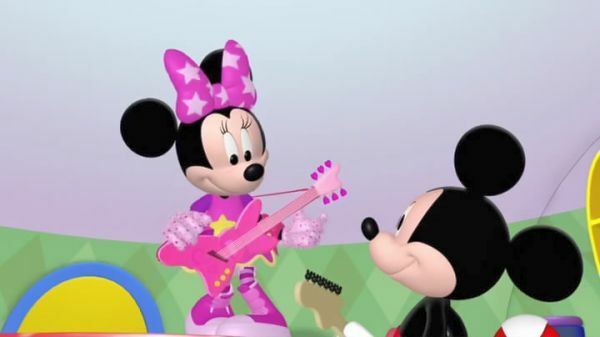 I mean, pop star Minnie! MINNIE: Hello there, Mickey! Oh, I can't wait to sing today at the battle of the bands, and I, um, was wondering. What do you think about you and me doing a song together? 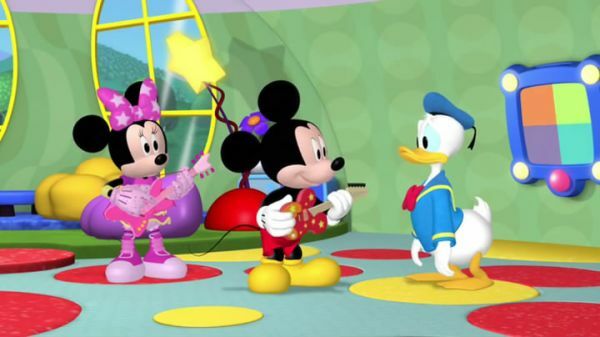 MICKEY MOUSE: Why, that's a great idea, Minnie! 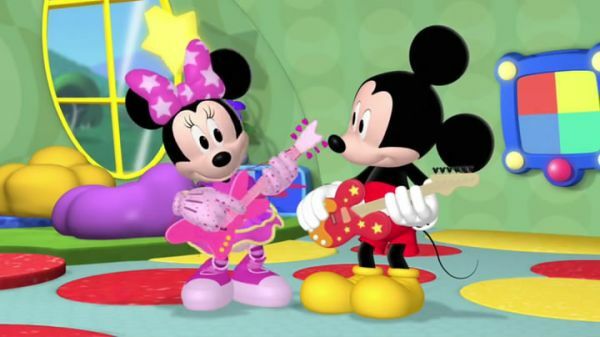 The rocking Mickey and pop star Minnie band. Oh gosh, we'll be stars! But I still have to figure out how to end the song. DONALD DUCK: Mickey! Hey Mickey! Can I be in your band? Can I sing with you? MICKEY MOUSE: Oh, well. 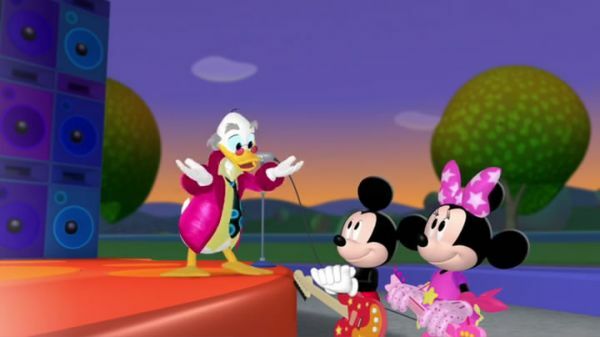 I already promised Minnie that she and I would sing, Donald, but... DONALD DUCK: You did?! Aw, nuts! MICKEY MOUSE: Donald, wait! Gee! I was just going to tell him that we'd be happy to have him sing along with us! MINNIE: It's ok, Mickey. Maybe we can find him at the contest later and let him know that he is welcome to join our band. 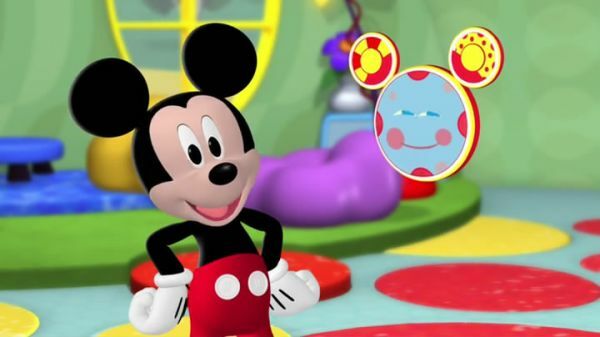 MICKEY MOUSE: Oh, good idea, Min! He's not the only one who could sing with us. Would you like to join us For the Clubhouse battle of the bands? MICKEY MOUSE: Hot dog! You rock! Come on, let's go get our mouseketools. To the mousekedoer! Oh, toodles! It's time to get to it. CHORUS: Here are your Mouseketools! MICKEY MOUSE: We've got two wooden spoons. A comb and wax paper. Oh Gee, that's different! Pots and pans. And the mystery mouseketool. That's a surprise tool that can help us later. 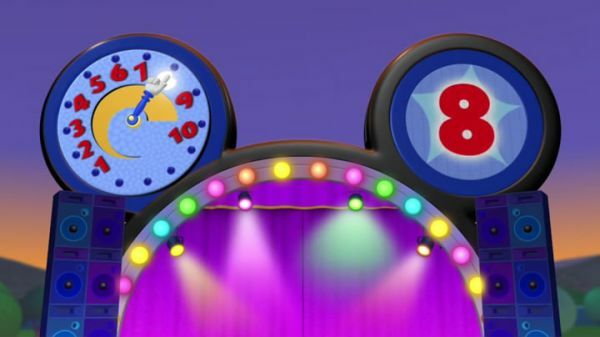 MICKEY MOUSE: Toodles has the tools! Now that we've got our Mouseketools, let's get rocking! PROFESSOR VON DRAKE: Hello, and a great big howdy-do, to you everybody! Welcome to the Clubhouse battle of the bands! Now this right here is my newest invention: the von Drake mouseke-clapper! Here is how it works. After each band's performance, I would like you to clap your hands. Why don't you clap with me, would you? As you can see, the mouseke-clapper always starts on the number one. When you're clapping, the pointer goes up, up, up. And that way the mouseke-clapper tells us how much you're all liking that band. Now watch what happens when you're clapping a little more! How about that? And when you clapping up a storm even more than that, the little pointer goes up even higher. This time from number one to number eight! MICKEY MOUSE: Wow! MINNIE: Oh, my. PROFESSOR VON DRAKE: So, the band that's getting the most hand-clapping will going to get the highest number. And that's when they receiving a super special best-est of the best award!